Welcome Back, Ruth!! 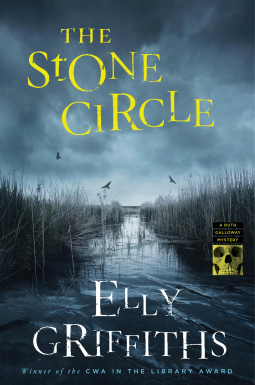 The Stone Circle (Griffiths) – Joyce's mystery and fiction book reviews with some non-fiction too! Last year, Ruth was in Italy (The Dark Angel). This year she is back in Norfolk in a superb entry in a most favorite series of mine. The first Ruth Galloway mystery, The Crossing Places, is referenced in this book. The murder and its solution are thought by the characters to have links to the current crime. I love this series so much that I urge you to start at the beginning. However, you can read this as a standalone. There are mysteries here including a cold case and a current baby abduction. Both story lines are suspenseful and the pieces all come together with the clues there for the reader. I think though that true lovers of this series read it for the characters and the updates in their personal stories. If that is part of what you enjoy in the Ruth books, you will not be disappointed. Every favorite character and relationship is here. The only bad thing about having read this book is that now I have to begin the long wait for the next in the series. Enormous thanks to NetGalley and the publisher. All opinions are my own.